If you take a look on GitHub there is now an example implementation of the Go to Goal strategy described in the previous post. 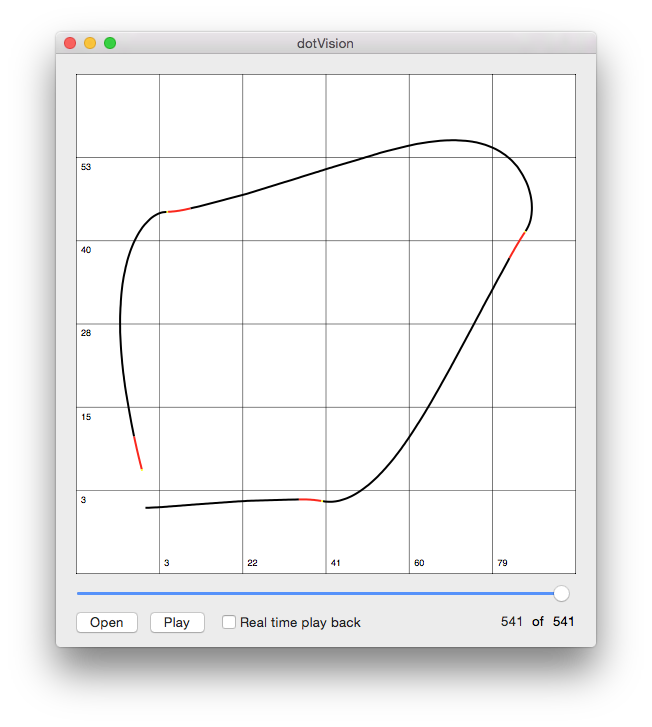 I’ve also committed the dotVision project, a simple Objective C application (provided as an X-Code project) for OSX that takes log files of data from the robot and plots it either on the same timescale as the data was created or in one hit. This is a useful debugging tool to quickly visualise 2D data that the robot is / was processing (future improvements will include socket support to take a feed of data in realtime (ie. via WiFi) to plot progress). The screenshot shows the dead reckoned position co-ordinates of the Go to Goal strategy module (ie. where it thought it was in its 2D co-ordinate system as it followed the defined waypoints). It would of course be interesting to be able to overlay this with the actual measured position of the robot. The trace is black while the strategy thinks it is still far from the next waypoint, red as it believes it is approaching the waypoint and yellow when it stops as close as it can to the waypoint. You can see that while it hits the first and second waypoints easily, the interaction between the PID controller tuning and the simplistic implementation of “set forward velocity” leads to a very loose turning circle as it adjusts its heading for the third waypoint. When the strategy sets out for a waypoint it takes its current (believed) position (in theory the middle point of the robot between the wheels) and heading and works out the new heading required for the robot to be “facing” (directed toward) the next waypoint. It then drives at a set forward velocity until its (believed) heading is as close as possible to the required heading (the “set forward velocity” is modulated by changes to the left and right wheel velocities required to make any turns needed to track the reference heading: this is the job of the PID loop whose reference variable is simply the heading). Consider the very real possibility that due to a combination of PID tuning and physics the robot simply isn’t tracking well to its required path: perhaps it’s at (90,45) and wants to move to (0,45) but never quite manages to hit the straight line between them: at some point it will go past the target waypoint and … probably keep driving off into the distance. The simple solution implemented in the current strategy is to measure a vector between the current position and the waypoint. If the vector is noted to be “small enough” (relative to the size of the robot) the strategy believes it has reached the waypoint and stops. If the vector does not ever get “small enough” the strategy waits until it sees the size of the vector increasing (on the logic that for the bulk of the transit, other than some initial turning, from waypoint A to waypoint B, the vector should shrink) and when it notes a prolonged increase (ie. we keep getting further and further from the target) that is significant in the context of the initial vector between the two waypoints it “gives up” and assumes any further transit is only going to place it further from its goal. Initially the strategy calculated the reference heading just once (as described above) at the time it began a transit from one waypoint to another. The initial reasoning behind this was that the error from dead reckoning was assumed to be large (ie. once the journey from A to B had started the “believed” position was likely to be increasingly wrong). As such, recalculating the reference based on that dodgy position was just going to cause issues (this is somewhat of a moot point though: if the incremental believed position is wrong, the “final” believed position (ie. where we think we are vs where we actually are when we arrive at the target waypoint) will also be wrong and hence the next reference heading calculation for the subsequent waypoint will also be wrong. In reality the dead reckoned position over the distances of the experiment (less than 1m x 1m so not really useful or significant) was fairly accurate, so continuously recalibrating the “new” reference heading during the transit, based on “believed” position, rather than just once per transit, seemed to give better outcomes than doing it just once. As can be seen in the dotVision plot, the strategy of using a continuous forward velocity causes some issues when large turning circles are required. Rather than continuing to explore some of the adaptions above to the strategy itself the next steps for this robot will be to use the ultrasonic transducer to begin taking measurements as it moves and build a map of the surroundings. In future this information can then be used by the “Go to Goal” strategy to avoid obstacles, ideally I’d like to see the robot adapt a new path when an obstacle appears in between two of its desired waypoints.